Law Corner (www.lawcorner.in) Started its journey in the year 2018, with the objectives to provide a smooth platform to law students to boost their knowledge. Visitors will find a wide range of features including Judgments, Articles, Latest News updates, Career Advice, Questions and answers for competitive exams, Seminars, Legal Events etc. Lex Research Hub (www.lexresearchhub.com) is an online learning platform for the legal scholars, founded with an objective to provide study materials, job-related information, information relating to curriculum activity, guidance for the competitive examinations and offer courses for the students of management, law, social sciences, and professionals. The event is aimed at promoting the importance of the latest landmark judgments. This competition will enable the participants to know how these latest judgments have changed the overall course of justice. 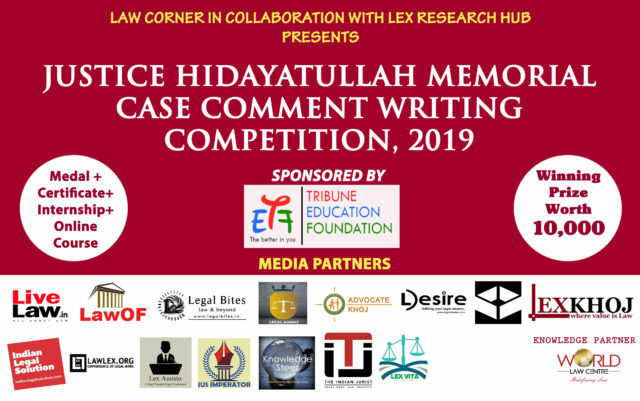 Law Corner is providing an opportunity for legal minds to express their opinions on these latest landmark judgments in the form of case comment writing. Students pursuing LL.B., i.e., 3-year or 5-year course from any recognized College or University or pursuing LL.M from any recognized University or preparing for the judiciary or pursuing any Bachelor Degree or Master Degree in any field. Atiya Sabri v Union of India & Ors [WP (Criminal) No. 43 of 2017] (SC Declares Instant Triple Talaq Unconstitutional Judgment passed on 22nd August 2017). First Prize- Certificate of Merit + Medal+ Cash Prize Rs. 3000/- + Internship opportunity at Law Corner and Lex Research Hub + 10 percent discount on the next event of Lex Research Hub & Law Corner. Second Prize– Certificate of Merit + Medal+ Cash Prize Rs. 2000/- + Internship opportunity at Law Corner and Lex Research Hub + 10 percent discount on the next event of Lex Research Hub & Law Corner. Third Prize– Certificate of Merit + Medal+ Cash Prize Rs. 1500/- + Internship opportunity at Law Corner and Lex Research Hub + 10 percent discount on the next event of Lex Research Hub & Law Corner. Top 10- Top ten selected participants will get a Certificate of Appreciation + Internship opportunity at Law Corner and Lex Research Hub + 10 percent discount on the next event of Lex Research Hub & Law Corner. Publication with ISBN no.- Top three articles will be published in a book with ISBN no by Tribune Education Foundation.